seriously affected in the United States. This is due in large part to the extreme prevalence of live oaks here, and the propensity for root grafting which this species has. It has been recognized by researchers and expert arborists that the vast majority of the spread of oak wilt occurs underground, from live oak to live oak, through these grafts. New infection centers can become established when spores are carried to fresh, unpainted wounds on healthy oaks. There are many sources of wounds that can potentially be an invasion point for the oak wilt fungus, including construction, wind, hail and animals such as birds, squirrels and insects. All of these are the source of literally thousands of wounds, very often in the spring. If oak wilt was as virulent as the general public often thinks, we would probably have few oaks left by now. Although there is a recognized increase in susceptibility in the spring, branches that are at risk of rubbing against buildings or against each other, or being hit by vehicles should be removed as soon as they are found, regardless of the time of year, as stated in the new guidelines. This is because when done properly, removing such branches probably reduces oak wilt risk. Calendar-based dates cannot reflect actual temperatures and humidity, which play a crucial role in insect activity and fungal spore development. For instance, in central Texas there are often many consecutive days in February and sometimes March in which it is too cold for insects to fly. Likewise in June it is often too hot for fungal spores to develop. This is why knowledgeable local arborists do not rely on calendar dates as guidelines. Dead branches are never an invasion point for the disease, and can be removed at any time. They should be painted if there is a chance that any live tissue is exposed. Competent arborists have known and adjusted for these facts for decades, and safely pruned oaks throughout the year. It is critically important that it be done judiciously, however. That is what makes hiring a Certified Arborist like Guy LeBlanc important. When the work is being done personally by someone with the level of experience he has, you know the tree care you are receiving is the best possible. 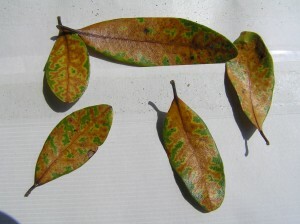 For more on this, see my January 2012 blog post and search YouTube for my Central Texas Gardener appearance from that month in which I discuss oak wilt. For initial consultation, call 512-301-8700.